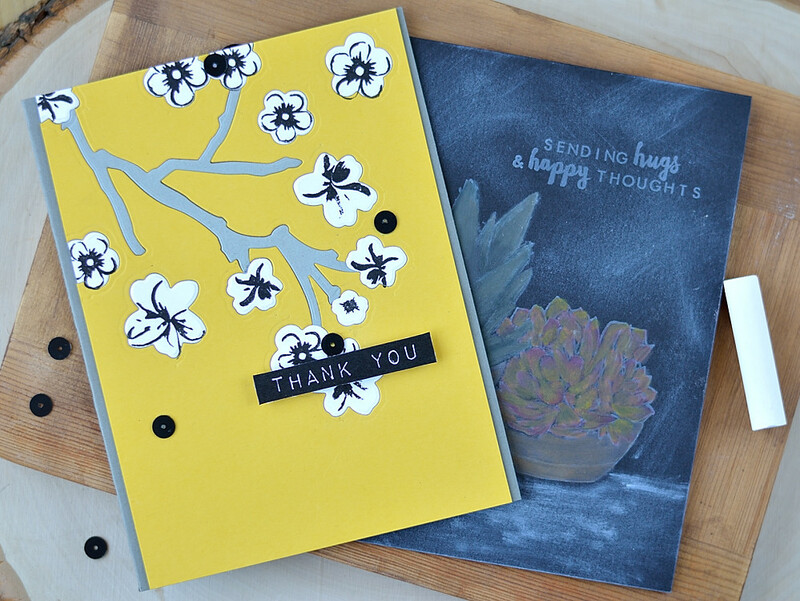 Yesterday on Altenew blog I shared two very different cards. They’re different in the final look, color palettes and techniques used. For the first card I used Vintage Flowers stamps set and the set of matching dies and it was made using layered die-cutting inlay technique. First I cut a panel from yellow cardstock, cut a branch out of it and then started cutting out different flowers (I used only smaller ones from the set). 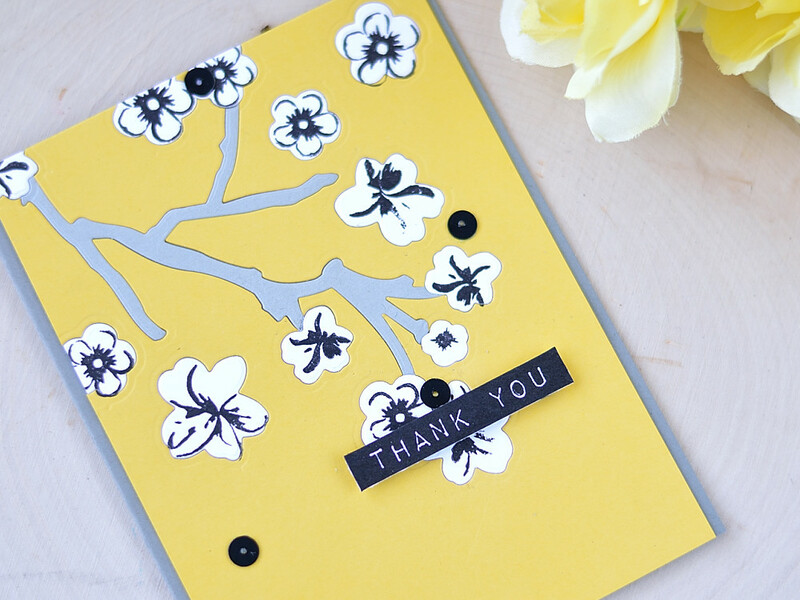 Then I cut a branch from gray cardstock and the same flowers from white cardstock. I double-cut the branch and some flowers in the areas where they overlap (which is hard to explain so maybe I will film a video showing this technique, so stay tuned). Then I adhered the panel to a gray card base and adhered all die-cuts in their negative space. 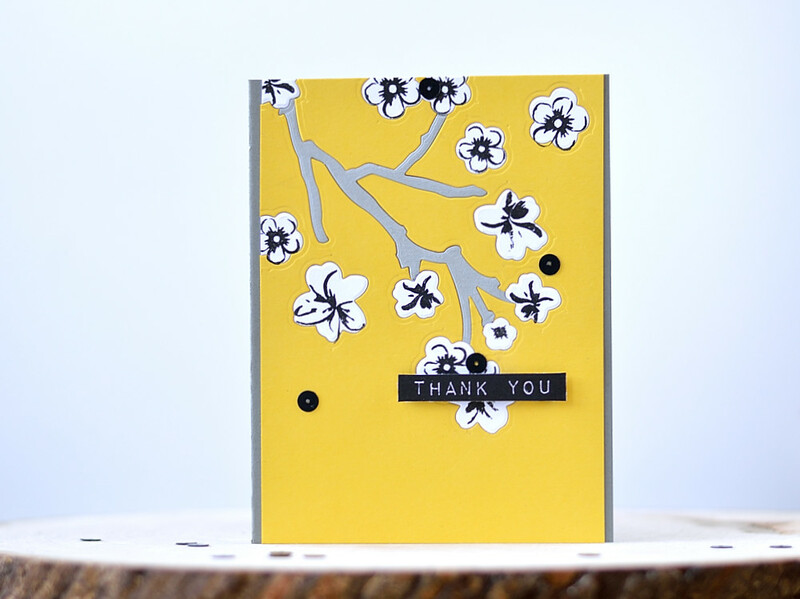 Added stamping to the flowers using Altenew Jet Black ink. These flowers are multi-layered, but I only used one layer. To finish off the card I added a sentiment from Label Love set and several sequins. Speaking of sequins.. First I wanted to add some gray sequins.. And even though I have like A LOT of sequins – I don’t have grays. I have some from Teresa Collins and Studio Calico but they’re huge (too big for a card), I have silver ones. But no true gray ones on appropriate for a card size… And I checked several sequins suppliers – they don’t carry gray sequins. When I realized that I had a “where is blank emoji?” moment. I mean … COM’ON! GRAY SEQUINS! Do we really need to request those? Maybe that’s only me (who is crazy about gray) but how come we aren’t offered gray sequins ? 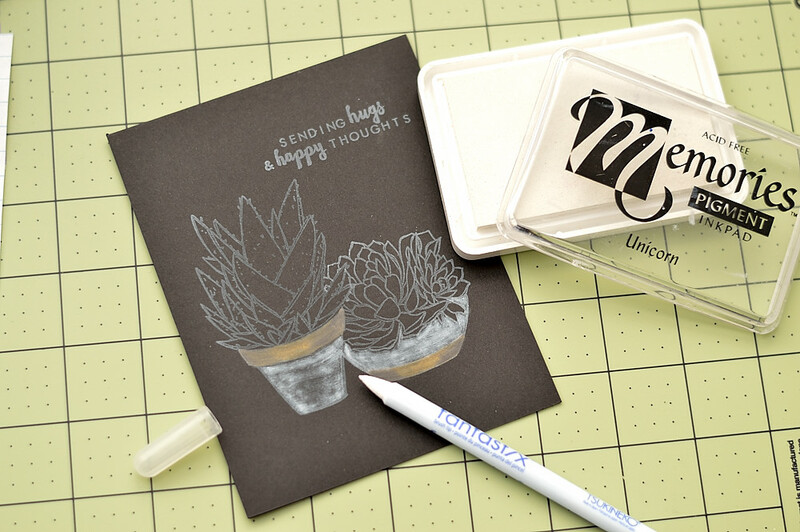 To make this card on a black card base I stamped succulents from Altenew Succulents stamps set and a sentiment from Beautiful Day using white pigment ink . 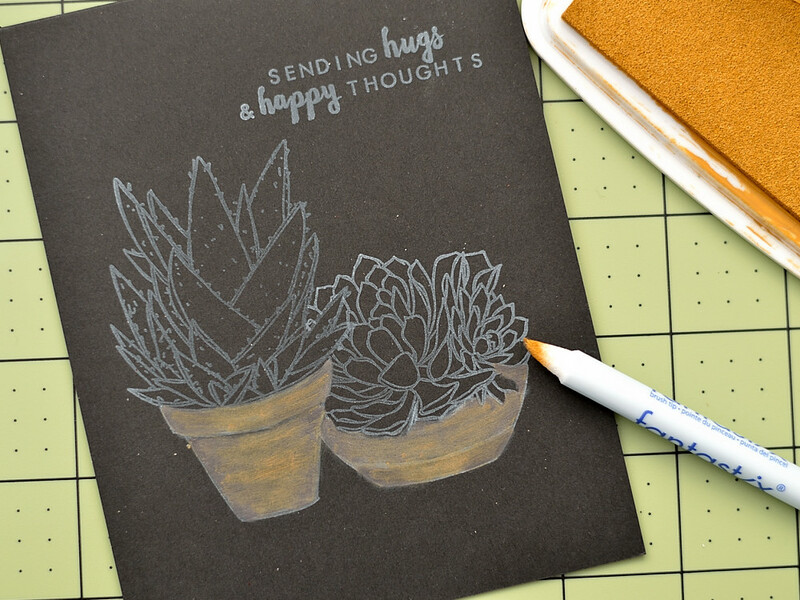 Then I started coloring the succulents. I first was covering parts of an image with white pigment ink using Fantastix tool. And then colored over with color pigment inks (I used Memento Luxe ones). 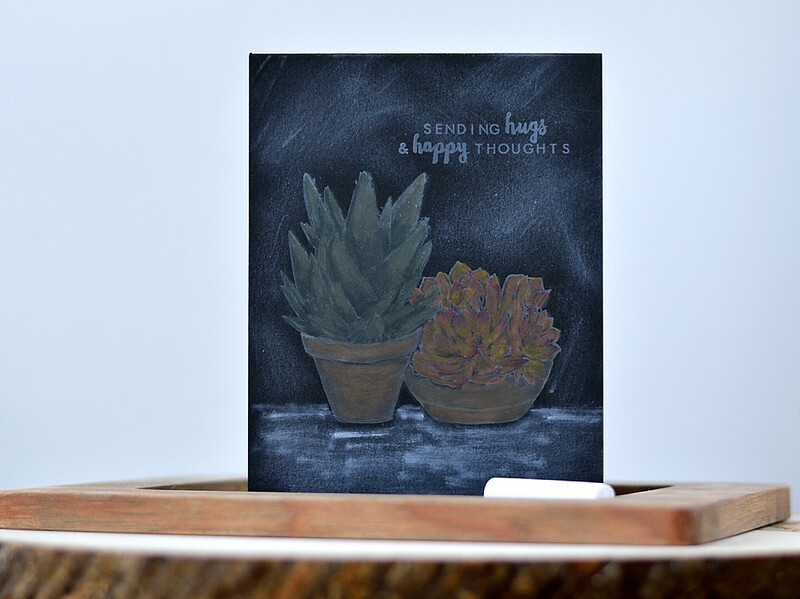 I drew a surface under the pots and added chalk effect by rubbing the card with a paper towel inked with white ink.